A new study suggests that Earth’s water arrived much earlier than previously thought, according to a recent release from Woods Hole Oceanographic Institution. Many scientists argue that Earth was dry at first and later gained water from comets. The new theory speculates that a type of early meteorites called carbonaceous chondrites brought water to Earth earlier. 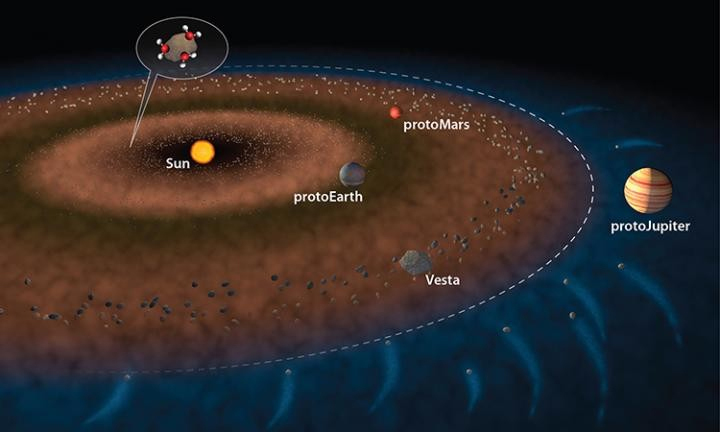 The scientists measured hydrogen isotopes from fragments from an asteroid that formed when the Earth was in its early building stages. They found a ratio of the asteroid’s hydrogen isotopes matched the that of the carbonaceous chondrites. The institution’s researchers believe their findings could also mean that apparently dry planets once held water. View the full illustration here.